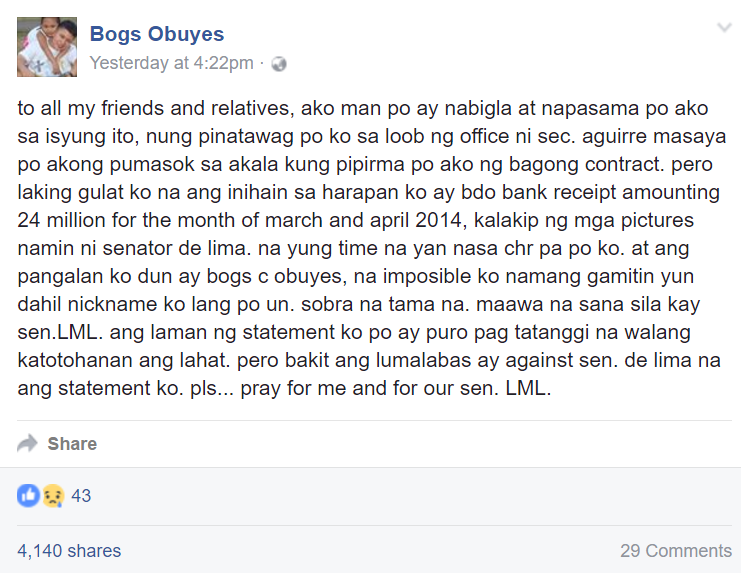 Edna “Bogs” Obuyes was Senator Leila de Lima’s staff member while the latter was still the secretary of the Department of Justice (DOJ). Then I felt like something's wrong. NOTE: Obuyes is obviously a transgender man, so we will use male pronouns to address him throughout this article. A cursory look at the document, obtained from an anonymous DOJ source, shows several tell-tale signs of fraud. FIRST, 18 April 2014 falls on a Good Friday, a bank holiday, so an over-the-counter bank transaction could not have been consummated on that day. SECOND, "Bogs" is a nickname and banks require accountholders to use their real names. THIRD AND MOST IMPORTANTLY, "Diposits (sic)" and "₱24,000,000.00 millions (sic)" are glaring typographical errors that are not likely to be committed by presumably well-educated DoJ employees. Any self-respecting DOJ employee, especially if acting with Aguirre's imprimatur, would not have committed such glaring grammatical and spelling errors in a document of such importance. Obuyes' post quickly went viral. The knee-jerk reaction here would be, "Wow, DOJ is so desperate to pin Sen. de Lima that they even resorted to manufacturing evidence!" A couple of hours later, current Justice Secretary Vitaliano Aguirre said in Filipino, “We are still verifying those documents because we do not want to be embarrassed [Star].”On one hand, the DOJ may have fabricated evidence. But on the other hand, it might be a trap that DOJ's opponents have set up. So who's telling the truth? A closer look at the documents shows some rather startling clues. For the record, this article was written on 02 September 2016 at 5:00 PM. Why is that important? Because the trick here is in the timestamps. The Philippine Star said they got the deposit slips from an unnamed DOJ source, so their story should be an exclusive, i.e. they are the first news outlet to publish this story. The time stamp on the Philippine Star article states "Updated September 2, 2016 - 12:00am" or midnight last night. It doesn't really tell us much, as there had been an earlier version of this article. However, looking further down at the Disqus comment section shows that the oldest comment, written by a Ros Feliciano, was 16 hours ago. It's 5:00 PM right now so "16 hours ago" should be anytime from 12:00 AM to 2:00 AM, or some time after midnight last night. This suggests that the time difference between the the first version and the second version shouldn't be too long. Why? Because updating an article does not reset the comments section. Surely, if the article was published during the daytime of 01 September 2016, somebody else would've already commented before that Ros Feliciano person. Now, another tell-tale sign is in the hidden data of the graphic used in this article, which is the photo of the deposit slips. It is safe to assume that the photos were already there in the 1st version, and that the update merely affected textual content. Why? Because the photos are the most essential element to make such a leak credible. Using Mozilla Firefox, I right-clicked on the photo of the deposit slip then selected "Copy Image Location". On a new tab, I pasted the image's address and pressed Enter. 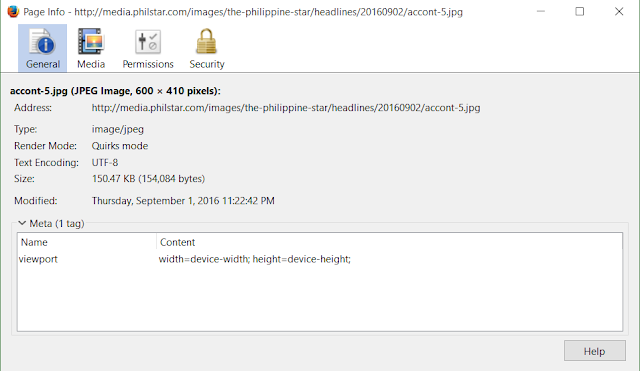 The image loaded then I right-clicked the image again then selected "View Image Info"
The popup window indicates that the graphic was created at 11:22 PM of September 1st, implying that the original version of this Philippine Star article was published between 11:22PM and 11:59PM of 01 September 2016. Hence, for the record, the original Star article was published after 11:00 PM of 01 September 2016. According to his Facebook wall, Obuyes denial was posted on Facebook at 4:22 AM of 01 September 2016. Clicking the time stamp on that post shows a different time stamp: 4:22PM of 01 September 2016. Whichever way it goes, it is clear that Obuyes' denial was issued on or before 4:22 PM of 01 September 2016. 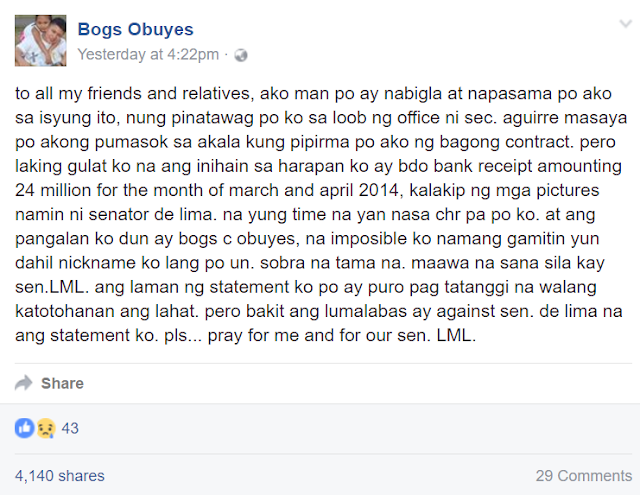 "to all my friends and relatives, ako man po ay nabigla at napasama po ako sa isyung ito, nung pinatawag po ko sa loob ng office ni sec. aguirre masaya po akong pumasok sa akala kung pipirma po ako ng bagong contract. 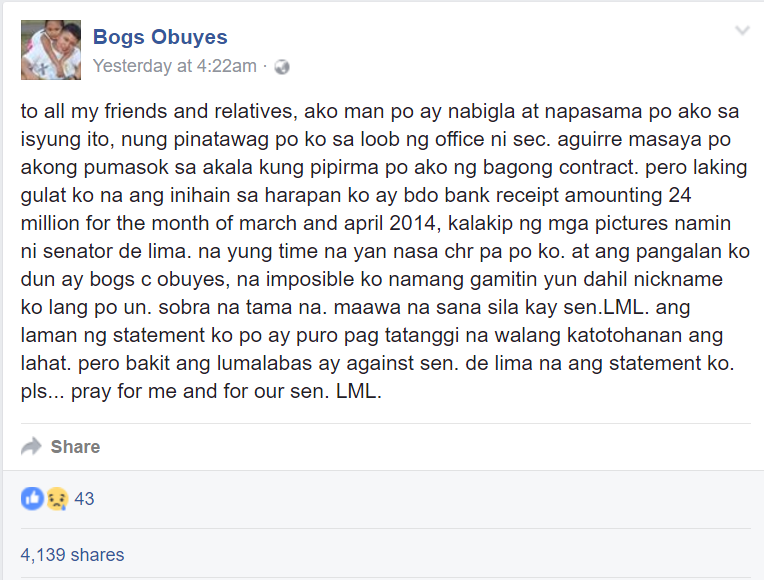 pero laking gulat ko na ang inihain sa harapan ko ay bdo bank receipt amounting 24 million for the month of march and april 2014, kalakip ng mga pictures namin ni senator de lima. na yung time na yan nasa chr pa po ko. at ang pangalan ko dun ay bogs c obuyes, na imposible ko namang gamitin yun dahil nickname ko lang po un. sobra na tama na. maawa na sana sila kay sen.LML. ang laman ng statement ko po ay puro pag tatanggi na walang katotohanan ang lahat. pero bakit ang lumalabas ay against sen. de lima na ang statement ko. pls... pray for me and for our sen. LML." I have explained that the glaring spelling and grammatical errors show that it could not have possibly been leaked by DOJ. Aguirre has been successfully defending Duterte since time immemorial and it just goes to show how good a lawyer he is. Moreover, the date stamp 18 April 2014 would have automatically made the evidence invalid, as it was a bank holiday on that day. Duterte eats court cases for breakfast with Aguirre as his metaphorical "yaya", so an error as glaring as this is impossible. Aguirre couldn't be that careless. It would have been possible if bar flunker Leni Robredo [TP: LNMB] was DOJ Chief , but she isn't. In short, somebody else leaked it, and it's not with Aguirre's permission. With that said, and assuming that Obuyes was indeed interrogated by Aguirre prior to the Star leak, Aguirre could not have possibly showed Obuyes the deposit slips. Why? Because the deposit slips are questionable as it is, and it will just give Obuyes (and by extension, de Lima) more reason to attack Aguirre's credibility. Surely, Aguirre doesn't want that. Bad evidence plus media coverage is bad for DOJ and Duterte. How can Obuyes deny the deposit slips whose existence he should not have known about? How convenient is it that just several hours later, the broadsheet published an exclusive on the the same exact deposit slips in question? Now, these questions hinge on the assumption that Aguirre is a decent lawyer. 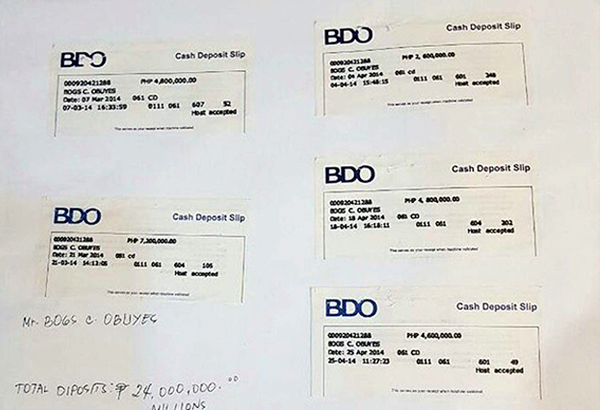 Besides, Aguirre wouldn't really need deposit slips as evidence because they have a direct line to the Anti-Money Laundering Council, which would have records of the 2014 transactions if they indeed exist [Abad]. Deposit slips as a lead? Yes. But as evidence? No, not really. And why did Obuyes refuse Aguirre's request to undergo a polygraph (lie detector) test [GMA]? How can Obuyes, a mere clerk and non-regular employee, have the guts to defy the sitting Justice Secretary? Is he being protected by a "higher power", such as his former boss? In May 2014, then-President Benigno Aquino III defended Cabinet members named in Janet Lim-Napoles extended affidavit, insinuating that the multiple copies of the list are meant to delay the investigation [Inq]. 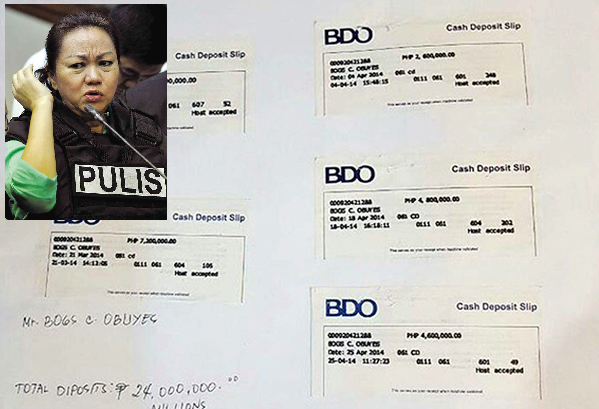 The Napoles Pork Barrel Scam has been fraught with controversy, as some of Aquino's cabinet members were implicated in some of the versions of the list. Included in one of the lists was former Budget Secretary Butch Abad, who allegedly taught Napoles how to set up foundations as funnels for pork barrel [TP: FOI]. In short, the group who leaked multiple "Napolists" might be the Liberal Party itself, in an attempt to confuse the public and allow them the opportunity to choose the version which best suits their party's interests. And just recently, Duterte linked de Lima to the same Napoles case [Star]. This leads me to suspect someone is using the same tactic today. And I have a pretty good idea who it is [ThinkingPinoy].